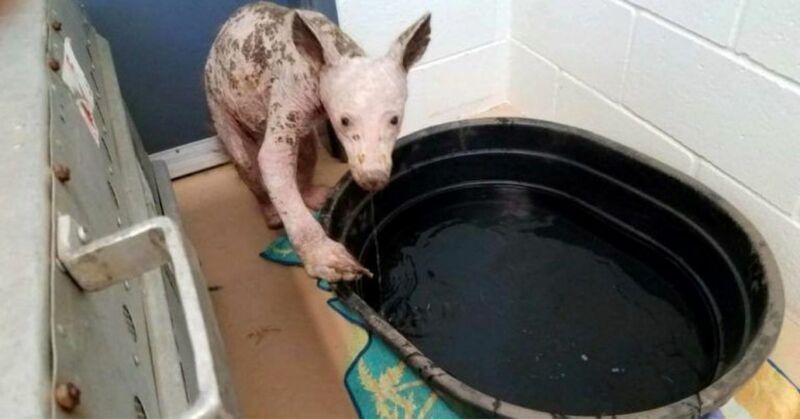 When people in California first came across a hairless animal digging through dumpsters, they couldn't believe their eyes. The group called a local rescue, and rescuers discovered that the creature was actually a young black bear without any fur. People from the rescue organization caught the bear and transferred her to the California Department of Fish and Wildlife. From there, the California Department of Fish and Wildlife contacted the Humane Society of the United States. It turns out that the bear's hair loss was caused by a skin disease called mange. Mange is caused by mites in an animal's skin, and the condition is painful. In Eve's case, the mange was so severe it had spread all over her body, causing her to lose all of her hair. The bear needed to recover in a sanctuary where she could receive the care that would restore her health. It was Christmas Eve when two volunteers from the California Department of Fish and Wildlife drove the bear to the Fund for Animals Wildlife Center. There, the wildlife center worked to create an environment that would help the bear to heal. Because Eve's mange was so extreme, the wildlife center had to carefully consider the types of bedding and materials used in her surroundings because they could further irritate Eve's skin. In addition, because mane is contagious, the environment had to be as sanitary as possible. When Eve arrived, she was given her own special sanctuary. Although staff believe that Eve will completely recover, it will be a long road and will take some time. Once she's healed, Eve will be released into the wild. Eve explores her room daily and decides which items she would like to shred. She drags the items into her igloo and makes a nest each night. Eve also loves all the fresh fruit that she gets to eat, though apples are her favorite. You can see Eve take apples back to her nest in the video below.